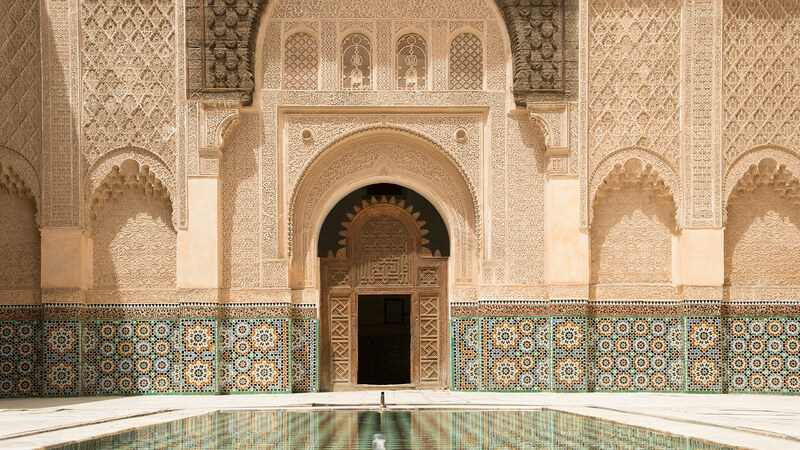 Just a stone’s throw from Europe (or 13km to be more precise), Morocco conjures up images of mystery & exoticism, a vivid spectrum of sights and colours, it is a world far-removed from the West, but where Europe meets Africa – it is at once captivating. 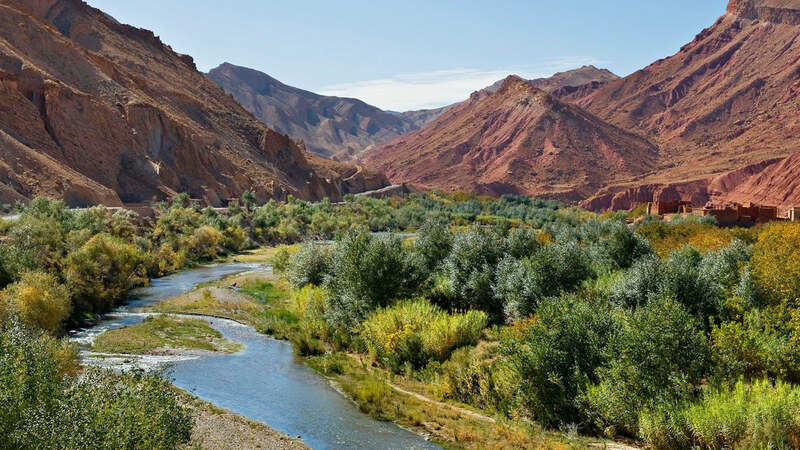 Undoubtedly, Morocco’s main attraction, aside from its climate, is its wonderful array of beautiful open spaces, most of which remains unexplored. 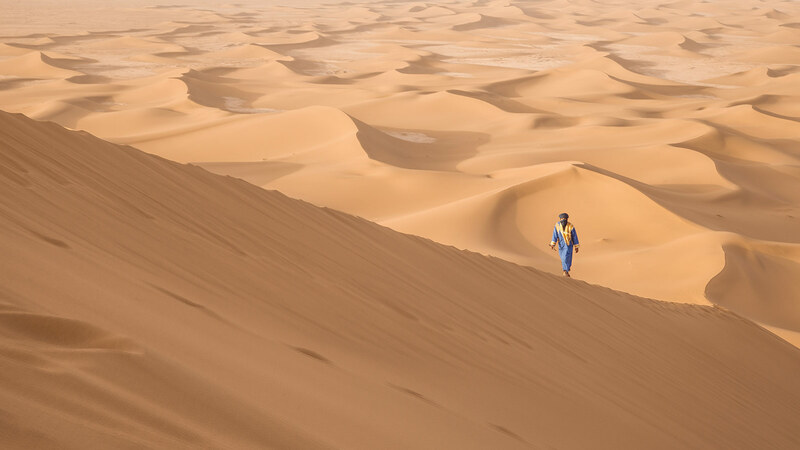 Morocco certainly offers it all in one breathtaking package; majestic mountain ranges (there are 3 ranges in the Atlas alone), a vast coastline and the spectacular wilderness of the Sahara Desert. Visitors to Morocco may not yet be aware of the country’s remarkable generosity and hospitality towards strangers. Breaking bread and taking mint tea together is a simple, yet significant, custom which you will have the good fortune to experience. 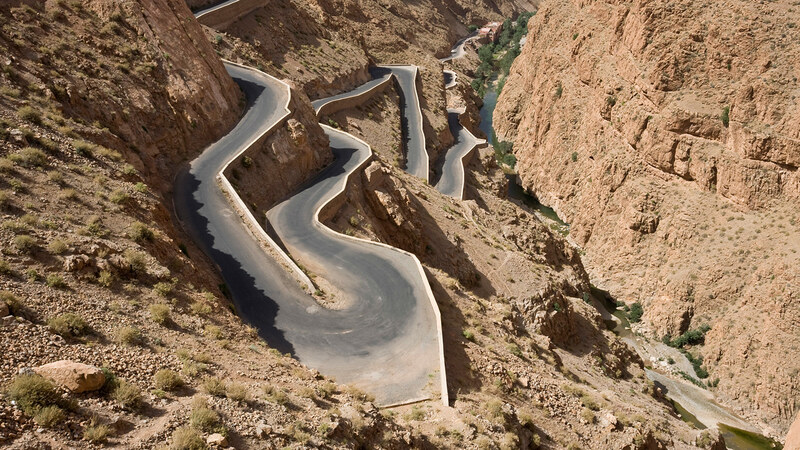 Below are a few facts that may reinforce or dispel your perceptions of Morocco. If you still have any questions after looking through the following, please don’t hesitate to contact us. Morocco enjoys on average more than 300 days of sunshine per year and the sun is deceptively strong even in winter. In the cooler months, the mountains and desert (yes, the desert!) are bitterly cold at night, so layering is essential. 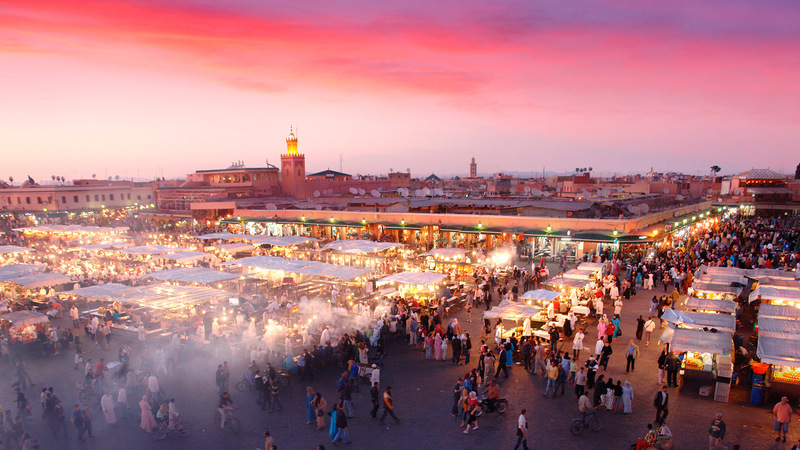 In the summer, Marrakech can see temperatures exceeding 45 degrees C, and further south even fiercer. The Atlantic coast enjoys a temperate climate all year but the summer feels colder than winter due to stronger sea breezes. Rainfall is never prolonged, but intense, and to witness rain in the desert is certainly special. The snow-line does not normally pass below 1800m. The Arabic name given for Morocco, by medieval historians and geographers, is “al-Maghrib al-Aqsa”, translated as furthest westerly kingdom (of the Maghreb countries in North-West Africa). Morocco is just 13km from Spain but is smaller than its neighbour, despite its territory bordering 3500km of the Atlantic and Mediterranean coastlines. The country is dissected in two, north-east to south-west, by the Atlas Mountain ranges (Middle, High, Anti) and it shares a border with Algeria and Mauritania. The Rif Mountains in the far North are visible from Spain’s Sierra Nevada. Marrakech is the southern-most of the four Imperial Cities (together with Fes, Meknes and Rabat in the North) and is ideally located to get into the great outdoors; 1hr to the Atlas, 3hr to the beach, 5hr to the start of the pre-Saharan oases, and 7hr to the Sahara itself. The Western Sahara is Moroccan-held territory, although disputed. Morocco is a very safe, tolerant and relaxed country. Its generous hospitality knows no bounds and you will be exceptionally well looked after wherever you stay. Moroccan culture is rooted in Islam and is very traditional. We therefore remind you to be respectful of certain aspects of society here, in particular with your dress and during the fasting month of Ramadan. In Marrakech, and on the beach, “anything goes” dress-wise but expect to get noticed if that’s the case. In rural areas avoid having too much skin on show, so cover up your arms and legs as much as possible. 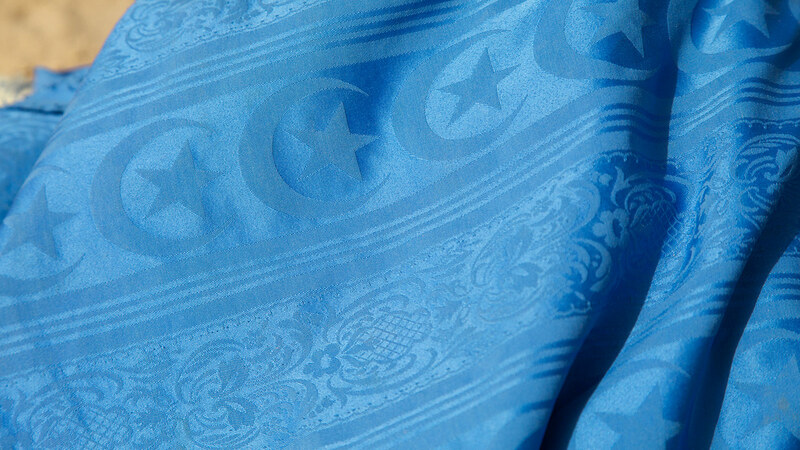 The month of Ramadan, calculated by the lunar calendar, is a particularly sacred time for Muslims and you should be mindful of your dress even in Marrakech. Also, at this time, think twice before openly drinking, eating or smoking in public spaces during the day, especially so near areas of worship. When shopping for souvenirs, homewares, items of clothing, etc in the souks (markets) expect to have to haggle over the price; this is perfectly normal and all part of an elaborate bargaining game between you and the shop-keeper! Have a price in mind before you start the negotiations and try to keep to it. Don’t forget, you can always walk away from the negotiation at any time (this often helps the shop-keeper come round to your price!). Tipping is also an established practice in the tourism service. Tipping remains entirely discretionary but is a very welcome and accepted way for guides, drivers, cooks etc to support their incomes. We can provide further guidance in this respect. Moroccan food is absolutely delicious and good for you too; lots of fresh, seasonal fruit & vegetables, all grown in Morocco of course, lean meat (often lamb) and a variety of colourful herbs & spices (paprika, saffron, cumin, ginger, cinnamon, coriander, etc). Well-known dishes include tagine (named for the conical earthenware pot that the dish is slowly cooked in, over charcoal) and couscous (semolina steamed three times to keep it light) which is usually eaten on Fridays, the Sabbath. Other notable dishes include pastilla (filled filo pastry parcel, sweet & savoury), mechwi (roasted whole lamb or sheep, sometimes cooked in a fire-pit in the ground, popular at weddings and festivals), harira (bean and chickpea soup, tomato-base, eaten to break the fast during Ramadan), tanjia (jugged beef or lamb, slow-cooked in the embers of a fire), and flavoursome salads. Dessert is not really a big deal at mealtimes, and, usually, fresh fruit (pomegranate, melon, peaches, grapes, for instance) is served and a glass of the ubiquitous mint tea. Other fruits particular to Morocco are figs, dates and prickly pears. Sweet treats are wonderful Moroccan pastries, often made with almonds and honey and not too sickly, and they make a thoughtful gift to take along should you be invited to a Moroccan home. From a European perspective something as simple as making a cup of tea or baking a loaf of bread, here in Morocco carries huge cultural significance. 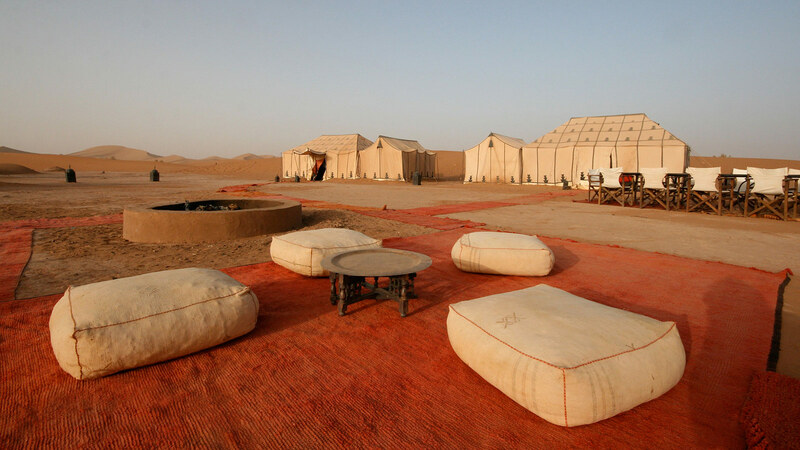 You will most likely experience this in the desert; witness the staple of every meal, bread, baked fresh in the hot sand beneath the coals of the campfire and take part in the art of the tea ceremony. Nothing is rushed! The preparing of tea is a social ritual that opens dialogue and connects peoples with their heritage. You will no doubt enjoy countless glasses of tea during your adventure with us. The Berbers were of course the original people of Morocco, the Arabs didn’t invade until the 7th C. Eventually, nearly all Berbers converted to Islam and were accepted by the Arabs as fellow Muslims. Today, most Moroccans can claim both Berber and Arab heritage. 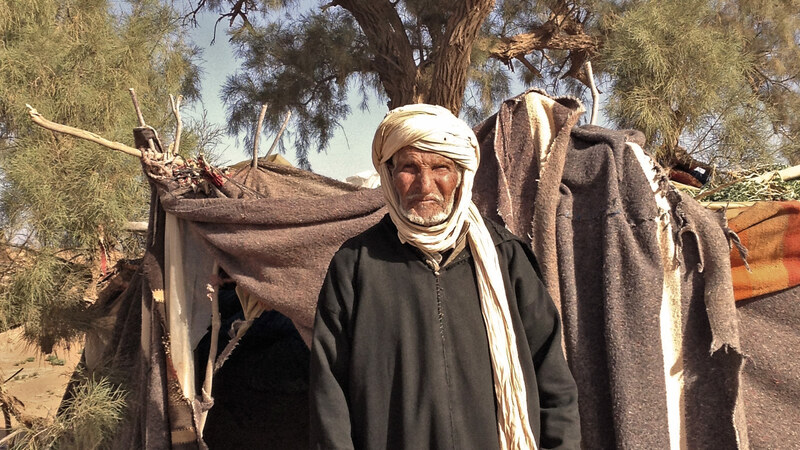 In the Rif and Atlas Mountains and in the South, including the desert, groups of pure Berbers remain. There are several different dialects of Berber spoken, according to specific regions in the country, and only since the Constitution of 2011 has the “Berber language” been officially recognised as Morocco’s second language (next to Arabic). Today, Berber identity is strong in Morocco and the people are rightly proud. Berber customs are unique in terms of art & design, music, dress & jewellery, and marriage rites. You will be fortunate enough to be absorbed in this culture. Flights from the UK take on average just 3.5 hours to Marrakech and are served by at least 6 airlines on scheduled routes. Marrakech airport is just 15mins drive from the city and we arrange to collect you at the airport. Alternatively, and with time to spare, you can reach Morocco by train in approx. 42 hours from London (we’ve done it!). This includes an overnight in Algeciras (or Tarifa) in Spain and then a short ferry crossing to Tangiers. Crossing times vary between 40mins (Tarifa) and 90mins (Algeciras). EU nationals don’t require a visa to enter Morocco and are permitted to stay for 90 days at a time. You will need to have 6 months validity remaining on your passport from arrival date. There are currently no official requirements for travellers to have specific inoculations before arrival but we recommend that you be up-to-date with jabs for hepatitis A, typhoid, tetanus, and polio. The Moroccan currency is the Dirham (MAD) and is a closed currency (although it may be possible to purchase it at certain airport forex desks). We recommend that you simply use a cashpoint on arrival, or change GBP or Eur at a bureau de change once here. Approx. exchange rates are £1 : 14.5 MAD and €1 : 10.5 MAD. Bottles of water (1.5l) cost around 6-10dh, small coffee or mint tea around 12-15dh, short taxi ride in Marrakech no more than 15dh, lunch/snack around 80dh in the main square of Marrakech. To get by on a first visit you may like to try out the below Arabic and even if you don’t speak it it may help you to understand some of the phrases you may hear around you. Le bes? – how are you? Morocco is a colourful mix of golden Saharan sand dunes, turquoise Atlantic water, rugged snow-clad peaks of Atlas Mountains and welcoming Berber people. The place where ancient history hides just around the corner. This is where the adventure begins. 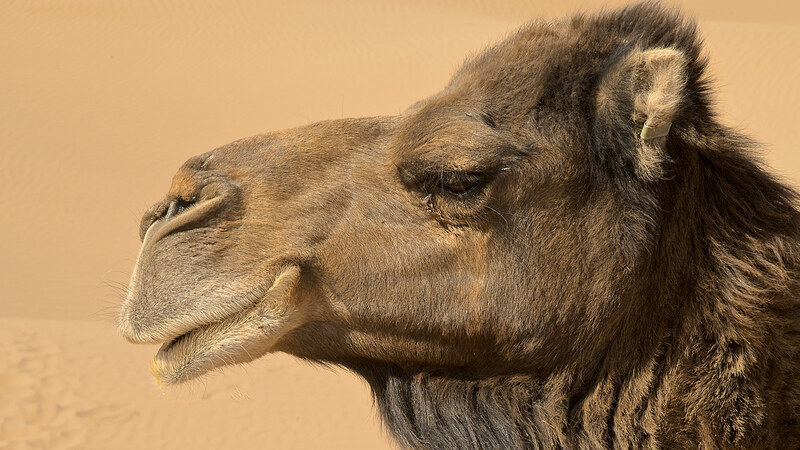 By exchanges of email and phone calls, Wild Morocco arranged an itinerary and places to stay tailored to our preferences. Yahya is an excellent guide and expert driver. He delivered us into the hands of wonderful local Riad staff at each stopover. We thoroughly enjoyed both the desert wild camping and then a night in a luxury camp on my wife’s 70th birthday. Yahya even managed to arrange and deliver a chilled cake and champagne to that remote site! Following the heavy rains (floods) of winter 2014 the desert and valleys were in bloom, adding to the glorious variety of landscapes that we were travelling through. We were finally dropped off at a Riad in the High Atlas mountains for a few days walking before returning to Marrakech. Yahya’s calm, courteous manner, and his caring knowledge of the society, culture and environment, added enormously to our enjoyment of this naturally beautiful country. It was a magical tour. 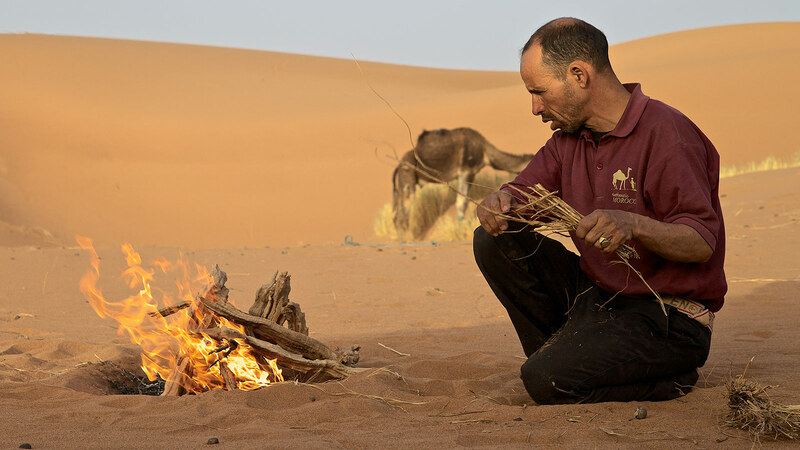 We thoroughly recommend Wild Morocco to discerning travellers, and wish Yahya and Emily every success with the business. We are now in Marrakech and hope we'll get the chance to do more tours with Wild Morocco. It was an unforgettable experience. Thank you millions. We've been meaning to get in touch to say thanks so much for the most amazing experience! Yahya was fantastic – he really looked after us but was also extremely relaxed, which made for the perfect holiday. He was also a really safe and smooth driver, which made us feel really at ease. We had a blast and will be highly recommending you! We loved our tour and will highly recommend you to our friends and to tripadvisor. Mohammed and Abdul were wonderful and our accommodation and guiding was top rate. We hope to deal with you in the future. Thank you for a great trip and itinerary. Thank you to you for all of your help in making Benjamin and J.T. 's trip an unforgettable, outstanding experience! They had a fabulous time!! They said that sleeping in the desert was awesome!! The whole desert trek was their favorite part of the trip! Every person they met was so nice and friendly, particularly you, Yahya, and also the driver that they had! They said that you were both such nice guys!!! They also said that the food was delicious, and the accommodations were great. They also loved the hotel in Marrakesh, so thank you for reassuring me that that was the right choice! Thank you for working so closely with me, as I was very unsure as I began this process. The kindness and consideration of your correspondence really put my mind at ease! Your guidance was so valuable to me every step of the way! You can be certain that I will work with you again and again in the future, and recommend you VERY highly!!! I can't say enough good things!! !